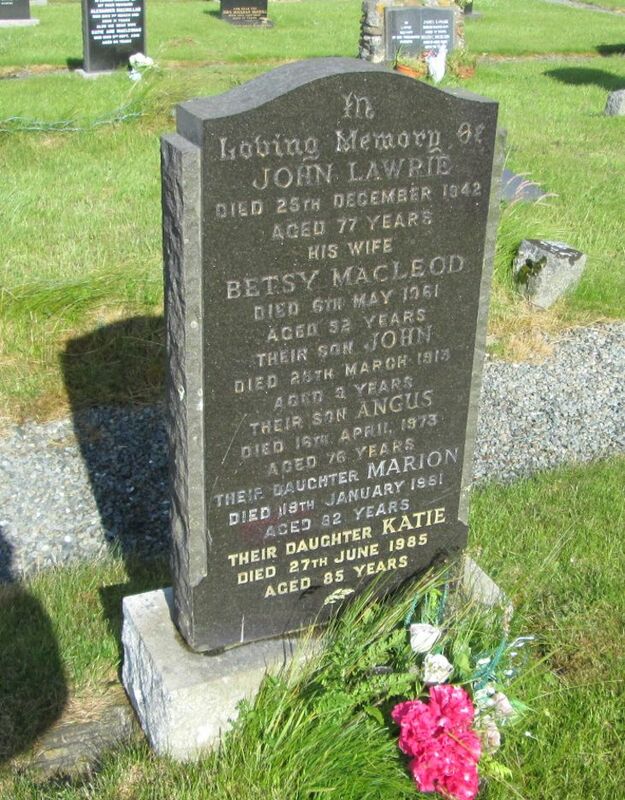 Skye Gravestones | John & Betsy (MacLeod) Lawrie,John, Angus & Katie. John & Betsy (MacLeod) Lawrie,John, Angus & Katie. In/loving memory of/JOHN LAWRIE/died 25th December 1942/aged 77 years/his wife/BETSY MacLEOD/died 6th May 1961/aged 92 years/their son JOHN/died 25th March 1913/aged 9 years/their son ANGUS/died 16th April 1981/aged 82 years/their daughter KATIE/died 25th June 1985/aged 85 years. Picture Added on 22 April 2018.